Revealed 1st through our friends at Power Rangers Now, we have our first confirmation of this years New York Comic Con Power Rangers Exclusives! First up we have the Tokyo Vinyl Touma Edition Mighty Morphin Megazord. A repaint of the popular vinyl in a striking new green and black color scheme. It will retail at the show for $60. Then we’ve got the Legacy Power Rangers Fighting Spirit Figure Set! An elaborate 3 figure set recreating the ghosts of Tommy’s past from the long loved episode of Power Rangers Dino Thunder. This set will retail for $80. Both exclusives will be available at the Bandai America booths #1628 & #1720 during New York Comic Con 2017 October 5th-8th! San Diego Comic Con is less than a month away and thanks to the official San Diego Comic Con website, we have our first look at the upcoming exclusives from Bandai America. First up – the very first Power Rangers Zeo Legacy item! It’s time for a Gold Rush as you will look stylish and sleek sporting your brand new 14K(ish) gold plated communicator. 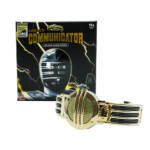 The Power Rangers Zeo Legacy Gold Ranger Communicator will be available at the show for $100, but will easily be worth thousands of dollars within moments of landing in someone’s hands because this is the only item worth purchasing at the entire convention this summer. And if you end up one spot in line ahead of me and you get a guaranteed ticket and I’m stuck with a raffle I am liable to put you on a voodoo doll when I return home, obviously in tears, because the greatest convention exclusive of all time didn’t land in my hands. Is it natural to salivate in a news story about a toy? For the Power Rangers Movie fans, a Legacy Movie Megazord figure will be available to purchase for $40. As of this time, we are unsure what differences this has from the original figure assembled with the Legacy Power Rangers Movie figures from earlier this year. Finally, a Tokyo Vinyl Black and Gold Megazord figure will be available for $60. More information on these exclusives, as well as their availability (as always they will be limited), will be released soon. Stay tuned for more updates! Teased mere days ago in Bandai of America’s offerings for San Diego Comic-Con 2015, one of the mystery items has been officially unveiled! 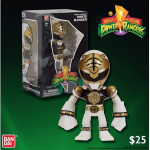 For sale exclusively at the Bandai of America booth for SDCC 2015 is the White Ranger Tokyo Vinyl Figure! This figure will retail for the reasonable price of $25. With only 2 items yet to be officially revealed yet and the convention itself less than 1 month away we should see the rest of the reveals in the very near future! The second exclusive from Bandai of America for this year’s New York Comic Con has also been revealed on the Power Rangers Facebook Page and surprise! 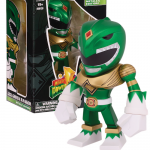 It’s another Mighty Morphin Green Ranger exclusive! This figure (in non-metallic paint) was offered at this year’s San Diego Comic Con but will be available in limited quantities in metallic paint at this year’s New York Comic Con. Pricing has yet to be revealed nor has the number that will be available. If you’re a collector of these Tokyo Vinyl figures then this is probably on your list to pick up. What do you think of this year’s New York Comic Con 2014 exclusives? Sound off in our discussion by clicking the “Discuss on the TokuNation forums” link! It’s sure to be a very interesting conversation!